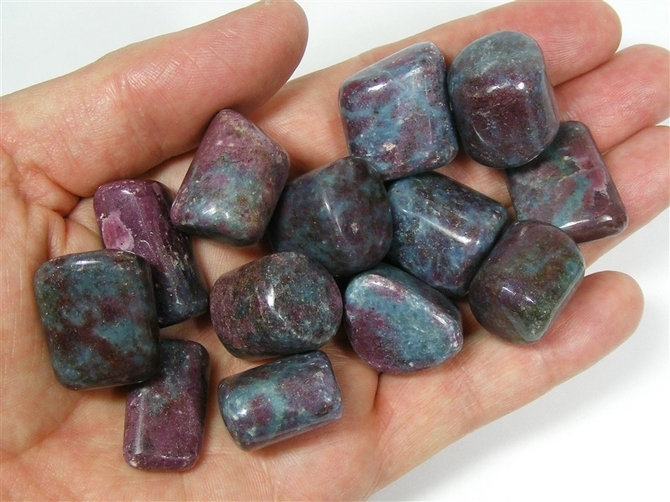 This lovely stone brings together the properties of both Ruby and of Kyanite. 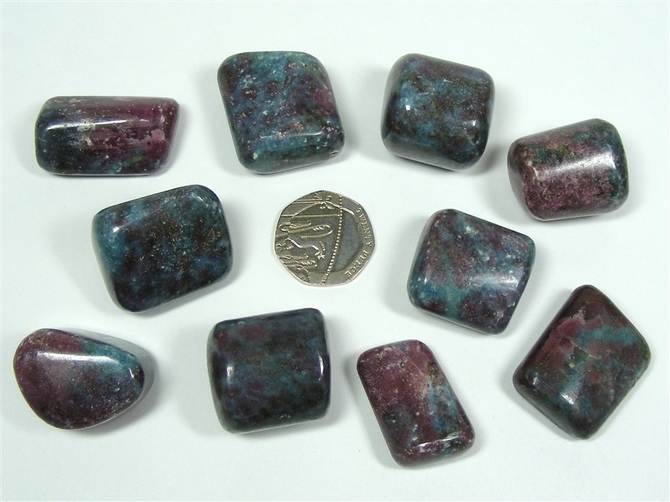 The deep red and blue colour is quite an interesting pattern and each stone has a good blend of both colours. Excellent for spiritual wisdom, positive dreams and meditation. Ruby helps us to overcome exhaustion and lethargy and is believed to be helpful in treating the spleen, adrenal glands, blood circulation and reproductive organs. Ruby is a stone of abundance and works with the energies of the Heart Centre. It stimulates both the mind and the emotions. It is both energising and balancing in its effects, firing us with enthusiasm, impulsiveness and spontaneity. It improves our motivation, engenders a positive mindset and helps us to become more dynamic as a leader. Truly, Ruby is a stone for passion! It fosters romance, marriage, integrity, devotion and passion. It helps in all matters of love and can increase virility. Ruby helps to bring us spiritual wisdom, clearer visualisations and helps us to develop on our path towards enlightenment. It is said to shield against psychic attack and to promote positive dreams. Blue Kyanite aligns all the Chakras immediately. It is one of only a few crystals that do not absorb negative energy and that therefore never needs cleansing. It is particularly beneficial for the muscular and urogenital systems, the throat and larynx and the adrenal glands. It is also thought to be beneficial for high blood pressure, period pain, and helping us with the release of excess weight. Blue Kyanite can dispel confusion, indecision and hesitancy making it easier for us to move forward. This in turn dispels anger, frustration and stress. These qualities make it an excellent crystal for communication and self expression, particularly among people, or groups of people, who don't see eye to eye. It helps us to bridge the gap between different ideas and different beliefs. Blue Kyanite has both a grounding, calming and tranquil influence, whilst at the same time, can also be energising. It provides us with support for ongoing projects and also smoothes the way for lasting relationships. Blue Kyanite is a superb stone for meditation. It provides us with a gentle "easy" energy that is spiritually balancing and that is a wonderful mover of blocked energy. It helps us to connect with our guides. Blue Kyanite stimulates our sense of intuition and increases our level of psychic awareness. It facilitates telepathy and helps us to remember our dreams more easily.